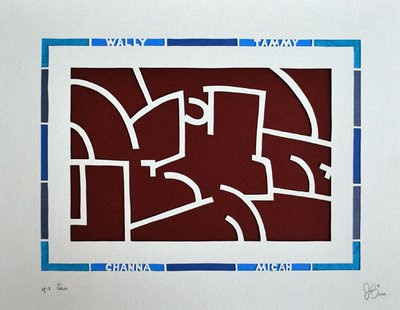 Isaac Brynjegard-Bialik: Nice Jewish Artist: Housewarming papercut:In wisdom, a house is built. In wisdom, a house is built. Just completed this piece for friends of ours, leaving town and setting up home in a new place -- the verse is from proverbs: "B'chokhma, yivneh bayit" (In wisdom, a house is built). Around the verse I have their names, with some simple linear blue fields.